On May 17, 1977, four months after Jimmy Carter was sworn in as US president, Israeli voters elected a right wing government for the first time in modern political history. Menachen Begin, a former Israeli underground “terrorist” leader, became prime minister. It was clear to President Carter that Begin had no interest in what the rest of the world referred to as a fair and just “peace” in the region. Carter quickly discovered that Begin was not going to be a “partner for peace”. Begin did not want peace; he wanted absolute control over the West Bank and Gaza. Every Israeli leader since 1977 has played Begin’s game of deceit and duplicity. It started overtly with Begin. His predecessors had the same goal. They were less overt, however, than Begin and his successors. 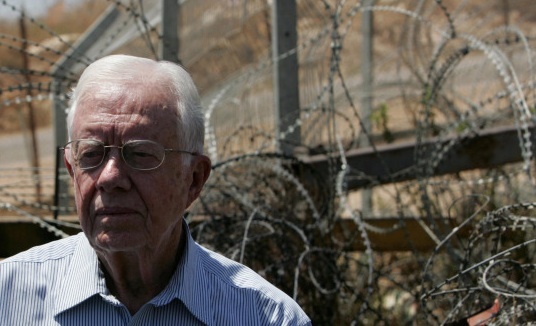 In his effort to halt Israel’s expansionistic greed, Carter fought Israel’s allies in the US, AIPAC and the US Congress. Carter’s opponents in the Georgia legislature had not prepared him for this depth of conflict, but it helped. Some of his Georgia opponents were self-righteous racists. Carter was the last American president to wage a vigorous political war with both Israel and its US allies. He fought alone, which as President Obama has discovered, is a lonesome struggle. Through persistence and with the help of an Arab ally, Egypt’s Anwar Sadat, Carter forced Begin to a Camp David agreement which led to a peaceful resolution between Israel and Egypt. What he was unable to do was to force Begin to keep his promises to halt settlement construction in the West Bank. Truth-telling was not a priority for Menachem Begin. Carter left the White House in 1981. His White House successors offered only token opposition to succeeding Israeli governments, each of which continued Begin’s expansionist program into Palestinian territories. In 2008, the American public chose a young president who promised change. Barack Obama immediately ran into an even stronger pro-Israel opposition in the US, and an even more rigid right-wing government in Israel, than the ones Carter encountered. Two years into his first term, the Middle East record on Obama is not a good one. He has failed to halt the wars in Iraq and Afghanistan, and he has been unable to stem Netanyahu’s penchant for war over peace talks. Could the next two years bring any improvement? A new biography of Barack Obama offers some surprising hints that we have not yet seen President Obama when he is angry and pushed into a corner. The book, The Bridge, was written by New Yorker editor David Remnick, a former Washington Post Moscow bureau chief. Remnick covers Obama’s background, not his future. Remnick’s close study of the president, and his apparent reporter’s admiration for the task facing any president, may have produced in Remnick an understanding of what Obama faces, and some possible clues that offer some hope. Does there exist a Netanyahu 2.0, a Nixon Goes to China figure who will act with an awareness that demographic realities—the growth not only of the Palestinian population in the territories but also of the Arab and right-wing Jewish populations in Israel proper—make the status quo untenable as well as unjust? Without the creation of a viable contiguous Palestinian state, comprising a land area equivalent to all of the West Bank and Gaza (allowing for land swaps), and with East Jerusalem as its capital, it is impossible to imagine a Jewish and democratic future for Israel. There is nothing the Israeli leadership could do to make the current fantasy of an indifferent American leadership become a reality faster than to get lost in the stubborn fantasy of sustaining the status quo. Facts on the ground that emerged during 2010 strongly suggest that Netanyahu 2.0 is yet to appear. As a matter of fact, if there were a move to produce a more peaceful Netanyahu, it is most likely that an even more extreme right-wing government would ascend to power in Tel Aviv. Remnick’s book (a paperback edition is due out January 11) offers the reader some solid reading, well-researched into Obama’s past. The book helps explain how, in spite of all the negative attacks from both the liberal left and the far right conservative right against him, Barack Obama is prepared by experience and education to wade into the swamp of modern day international conflicts. What the book cannot tell us is how Obama will cope with Israel’s alliance of adversaries in Israel and in the US, an alliance rooted in absolutism. Obama has gone through two wasted years trying to placate Israel. He has suffered Hamlet’s “slings and arrows of outrageous fortune”, from a government and its enablers, without receiving a single small gesture of cooperation. Obama’s most recent action in his dealings with Israel followed the humiliating bribe his secretary of state offered to Bibi Netanyahu. After Israel rejected the offer, Obama took the bribe off the table. Ha’aretz reported on Monday, January 3, that Netanyahu told the Knesset’s Foreign Affairs and Defense Committee, that he had agreed to the U.S. suggestion of a three-month extension to the West Bank settlement freeze. If this little kabuki dance with Pinocchio undertones, troubled the US president while he was vacationing in Hawaii, no one on the media team with the president, reported that fact to the US public. Obama must have gotten the report, but he is a man who bides his time, and waits. After reading Remnick’s biography, I am prepared to wait along with Obama to see how many steps Netanyahu and his right wing government will take before Israel implodes. Meanwhile, as we wait, we should prepare for dark days in 2011. Things will only get worse. Right wing Israelis are in a position to replace Netanyahu with an ever more bragadocious leader, the current foreign minister, Avigdor Lieberman. When Lieberman was named foreign minister, J Street, which prides itself on being pro-Israel, posted this prescient video warning to American Jews about Israel’s possible next prime minister. Paul Woodward reports that in a Newsweek interview published this week, the magazine refers to Avigdor Lieberman as “Israel’s most popular politician,” but then calls him its “far-right” foreign minister. He is indeed, but since he is also — in his words — “the mainstream,” it’s time the American mainstream media desist from portraying him as being on the political fringe. Lieberman is a mainstream politician in a far-right country. Racism has been normalized in what should now be universally recognized as a racist state — Israel cannot claim to be nor should be characterized by others as a liberal democratic state. Were it such, Lieberman could not possibly have risen this far. In spite of its obvious embrace of racism, Israel continues to receive the unconditional support from the US, led by AIPAC, the Christian Right, PEP (progressives except Palestine) mainline Protestant churches and the US Congress. With this support from both US political and religious power blocs, Israel has become even more bellicose as it plans for future attacks on its neighbors. If the US power blocs are with us, who can be against us? If racism doesn’t faze Israel’s allies, military attacks on civilian populations can hardly be expected to generate any serious opposition. Not even plans against civilian populations. Juan Cole reports from a Wikileak release that Israeli Chief of Staff Gen. Gabi Ashkenazi has prepared plans for an Israeli military assault on both Gaza and Lebanon at some point in the next future. Could this take place in 2011? Are Israel’s allies in the US listening? The Norwegian newspaper Aftenposten has summarized an Israeli military briefing by Israeli Chief of Staff Gen. Gabi Ashkenazi of a US congressional delegation a little over a year ago and concludes that the memo on the talks between Ashkenazi and [Congressman Ike] Skelton, as well as numerous other documents from the same period of time, to which Aftenposten has gained access, leave a clear message: The Israeli military is forging ahead at full speed with preparations for a new war in the Middle East. Note: This war preparation is serious and specific, according to the paper, and clearly is not just a matter of vague contingency planning. These reports on Israel’s choice of war over peaceful negotiations have failed to penetrate into the Israeli safe zones in the US and Canada. Elsewhere, however, Israel’s aggressive conduct and its flaunting of international laws, has eroded what international support it might have previously enjoyed from other nations. Palestinian Foreign Minister Riyad al-Maliki said that in the coming weeks, Chile and Paraguay will declare their recognition of an independent Palestinian state based on 1967 borders, Israel Radio reported on Sunday. Al-Maliki said that Chile plans on making its declaration in the coming weeks, and that Chile’s president Sebastian Pinera is even due to visit the West Bank in three months. Paraguay is also expected to declare its recognition of Palestine in the coming weeks. Al-Maliki also announced the opening of a Palestinian embassy in Ecuador, which already declared its recognition of a Palestinian state. Last week, Ecuador became the fifth Latin American country to recognize a Palestinian state, following its neighboring countries Bolivia, Brazil, Argentina, and Uruguay earlier this month. Uruguay also announced that they planned to join Argentina, Brazil and Bolivia in recognizing a Palestinian state, and al-Maliki said that they would formally do so in March 2011. Earlier this month, Brazil, Venezuela and Argentina recognized Palestine as an independent state within its borders prior to 1967. The United States and Israel slammed these international positive steps “as counterproductive and damaging”. Meanwhile, Israel continues its steady pounding of Palestinian civilian populations. On January 2, the IDF launched air raids against refugee camps in Gaza. In the West Bank, Israel has concentrated its attacks on the civilian population with home demolitions and further land-grab incursions into Palestinian neighborhoods. Its so-called “security wall”, which is nothing less than a prison wall, has encountered continued protests by Palestinians. Two civilians have been injured in air raids on Gaza by Israeli forces, according to Palestinian emergency services officials, while the Israeli military says a projectile has been fired on Israel. A military spokesman said it was launched from the Gaza Strip into the southern Eshkol region on Sunday. No casualties or damage were reported. The Israeli army confirmed the air raids by its fighter jets, saying that they were carried out in response to Palestinian rocket attacks on Israeli territory on Saturday. Two people were wounded in one raid, which targeted the Nuseirat refugee camp in central Gaza. The other attack, on the Jabaliya refugee camp in the north of Gaza, led to no casualties. Israel claimed it attacked crowded civilian refugee camps to strike a Hamas center and an arms workshop. In Bi’lin, located close to the so-called “security wall”, where weekly protests have drawn increasingly harsh reprisals by Israel, a Palestinian woman died on Saturday after inhaling tear gas. Israeli soldiers shot and killed a Palestinian man as he approached a checkpoint in the northern West Bank early Sunday holding a glass bottle, the military said.Palestinian officials condemned the killing, noting that it was the second death of the weekend in the West Bank. Kershner concludes her story with the official hedging that reporters always get from the Israeli military: It was not clear whether the man killed at the Jerusalem checkpoint was “acting in a threatening way.” And, oh yes, she added that a spokeswoman said “details of the episode were being examined”. Does any of this sound like Netanyahu 2.0 is about to arrive on the world scene? It does not sound that way to me. Hold on to your peace posters, we are in for a bumpy ride. The picture above of President Carter was taken on a recent fact-finding trip Carter made with the Elders to the West Bank. His famous smile is missing. The picture is from the Foreign Policy blog, The Middle East Channel, where it appeared on March 26, 2010. Another excellent report by Jim Wall. I wish I could, but I cannot have any optimism regarding President Obama. I was one of perhaps 15 people who demonstrated in front of Obama’s vacation digs in Hawaii last Saturday, New Year’s Day. I held a 3′ x 6′ banner with a Palestinian-American activist friend: it read “NO WARS FOR ISRAEL” on one side and “AMERICA FIRST — NOT ISRAEL” on the reverse. Obama’s motorcade of about 20 vehicles roared out of the compound around noon; I can only believe that Obama saw our sign and the signs of others, but I have no expectation of any “change” in his, or America’s, policies toward the Holy Land. I’d like near-future events to prove me wrong; the Palestinians are due a break to rectify some of the vast injustice imposed on them since 1947 and before…. Thanks for bravely calling it as it is, as you always do. I liked the statement that, “Lieberman is a mainstream politician in a far-right country”. This applies to Netanyahu, as well. It seems to me that Israel prepares for war like there was no possibility for peace. And Israel prepares for peace to ensure it doesn’t happen. That is, not until there is nothing left of Palestine for it to gobble. But, Israel may finally learn the hard way about the laws of unintended consequences. Jim — very good summary of recent “developments” — absolutely right on Carter (and let’s be thankful he continues his efforts) — hope you’re right about Obama — will Rahm Emmanuel’s departure make any difference? But as you suggest, the tide is turning regardless of Obama — and the inevitable (?) continuation of Israeli violence will only increase that turn. Thanks, Jim. You are so incisive and directly to the point and problems. I send your blogs to my email list and I know that they applaud and appreciate them. Excellent article that is right on most of the way. However, I do not believe either Carter or Obama ever had any intention of finding Peace with Justice. Their public display of sympathy for the Palestinian cause is political. Anyone with any knowledge of Israel knows that they intend to dominate all of Palestine and eventually Lebanon, Syria, Jordan and most of Egypt. As Rabin said when asked why he attacked all his neighbors in his surprise attack in 1967, he said, “We need the land!” He also stated that “creating facts on the ground” is the way to have the world accept Israel’s conquests of their neighbors’ land. I am encouraged about South America’s defiance of the US Zionists position. Hopefully the rest of the world will follow. I am afraid this essay fails to mention some basic home truth, i.e. ever since the elimination of JFK, Israel’s supporters gained almost in total control of the corridors of power in Washington DC. They control the executive, legislature, economy and the judiciary, all through a chocking control of all the mainstream media. Eimanual is right and anyone interested in the details should read “They Dare to Speak Out.” However, since that book, the control has expanded to industry. The same extortion is working on corporations. Jim – another great piece tracing the arc of historic Israeli intransigence and American capitulation. The comment on Lieberman is spot on, but it appears that a recognition of some of the major shifts in Israeli politics and public opinion will take much longer to sink in with the American public. The tendency towards apologism in the U.S. is immediately tragic for Palestine and will, in the long-term, be tragic for Israel. Another comment concerning Don Wolf’s post that, “However, I do not believe either Carter or Obama ever had any intention of finding Peace with Justice. Their public display of sympathy for the Palestinian cause is political.” Having the honor of working with President Carter I can assure you that the cause of peace with justice is very personal for President Carter and is born out of love for the people of Palestine and Israel. There was absolutely no political power or prestige to be gained by writing “Palestine, Peace Not Apartheid”; in fact, that book and President Carter’s tireless efforts before and after on behalf of justice for the Palestinians has done the opposite, resulting in slurs, personal attacks, drops in popularity ratings, and other types of “political” damage. Nevertheless, at 86 he still carries the banner of peace with justice. It is a disservice to dismiss his efforts as political, an opinion that is certainly not shared by my friends, colleagues, and the general public in Palestine.